The new freedom of space – that is how we envision our bathroom and in particular our shower. Anyone who as a planner or installer wants to use this typically very limited space as effectively as possible can now rely on an exceptionally "slim" duo: GROHE SmartControl Concealed in combination with the new GROHE Rapido SmartBox. Thanks to the concealed technology behind the wall and elegant ultra slim design with only 43 mm outreach on the wall, GROHE SmartControl Concealed makes for additional space in your shower. The new SmartControl models are controlled with the same self-explanatory push and rotary knob technology and are available in square or round designs as well as in chrome or moon white finishes. 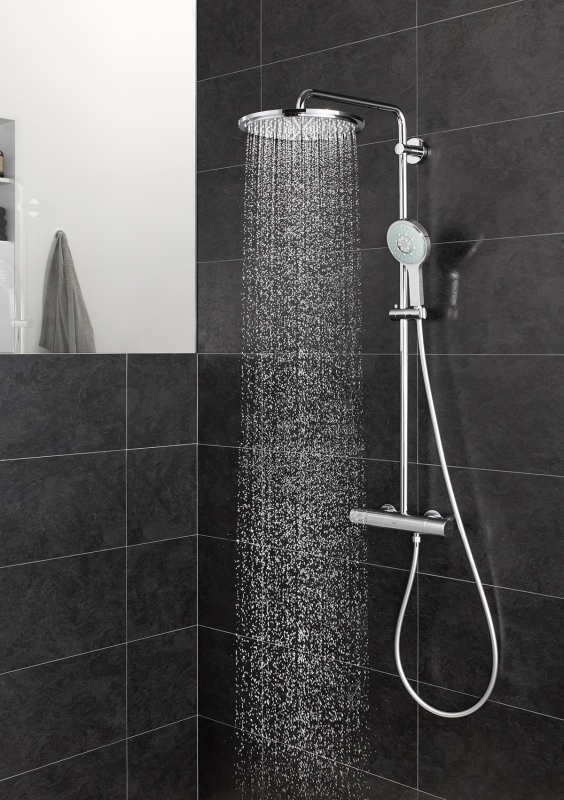 By combining the new two-stream Rainshower 310 SmartActive showerheads, the ideal solution is available for every bathroom ambience and every installation situation. One for all! Until now, for the operation of a hand spray and a showerhead with two types of spray modes, two rough-ins and two mounting kits were necessary. With the GROHE Rapido SmartBox and the GROHE SmartControl Concealed models these can now be operated simultaneously with only one rough-in and one mounting kit. This allows the control of up to three shower or bath filler functions with only one trim. Ultra slim design and more freedom of design! The GROHE SmartControl Concealed models project only 43 mm from the wall regardless of the installation depth of the rough-in and the GROHE SmartControl wall plate is only 10 mm deep. Thus, they make for a clean and modern appearance and provide comfortable room to move while in your shower. They are available in round or square designs as well as in chrome and moon white finishes. The integrated sealing system completely eliminates any water behind the wall. Less installation effort at lower costs! The GROHE Rapido SmartBox has three outlets for a wider range of showering options, for which previously two rough-ins were necessary. In addition, the GROHE Rapido SmartBox makes adapters practically unnecessary. It has ½ inch outlets to which all standard cables can be connected. Inlets from below! The GROHE Rapido SmartBox is equipped with inlets to be connected from below, which allow a direct connection to the hot and cold water supply. The use of 90-degree fittings is a thing of the past. Fits into every wall! With an installation depth of only 75 mm, the GROHE Rapido SmartBox fits into every kind of wall, even particularly narrow ones. Easy job-side installation! Thanks to the handy brass outlets, the connection to the pipes can be installed with the help of a pipe wrench so that the mounting on-site can be carried out fast and easily. A bench vice is not necessary. The temperature at which the water flow is to be started when a button is pushed can be pre-set on the thermostat handle. The revolutionary GROHE TurboStat technology maintains the desired temperature within a fraction of a second and keeps it constant throughout the entire showering process. The Grohtherm thermostats are equipped with a 38 degree Celsius SafeStop button and can be complemented with an additional temperature limit stop at 43 degrees Celsius.